From February 2017 to February 2018, real average hourly earnings increased 0.4 percent, seasonally adjusted. The increase in real average hourly earnings combined with a 0.3-percent increase in the average workweek resulted in a 0.6-percent increase in real average weekly earnings over the 12-month period. 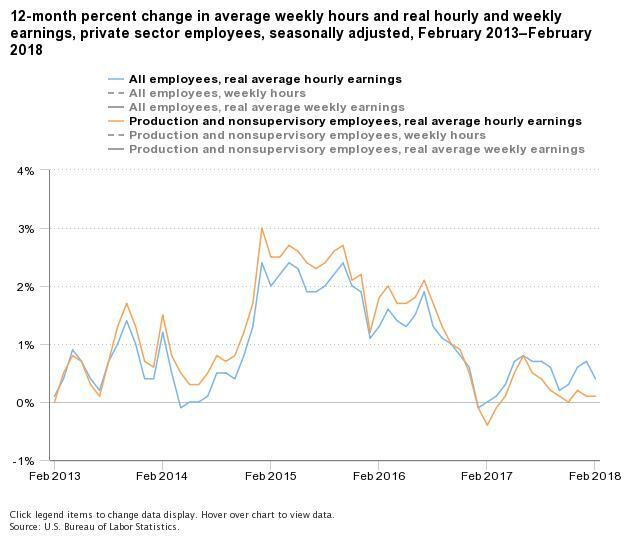 For production and nonsupervisory employees, real average hourly earnings increased 0.1 percent over the 12 months ending February 2018 (seasonally adjusted). The increase in real average hourly earnings combined with a 0.6-percent increase in the average workweek resulted in a 0.7-percent increase in real average weekly earnings over this period. These data are from the Current Employment Statistics program. Earnings data for the most recent 2 months are preliminary. To learn more, see "Real Earnings —February 2018" (HTML) (PDF). The Consumer Price Index is used to adjust earnings estimates for inflation.